“Who are you?” According to reports from a meeting of Disney shareholders, these are the first words spoken onscreen by Luke Skywalker in more than three decades. (In a canonical Star Wars film, that its. Skywalker has presumably not been under a gag order in the many Star Wars parodies and fan films produced in the time since Return Of The Jedi.) 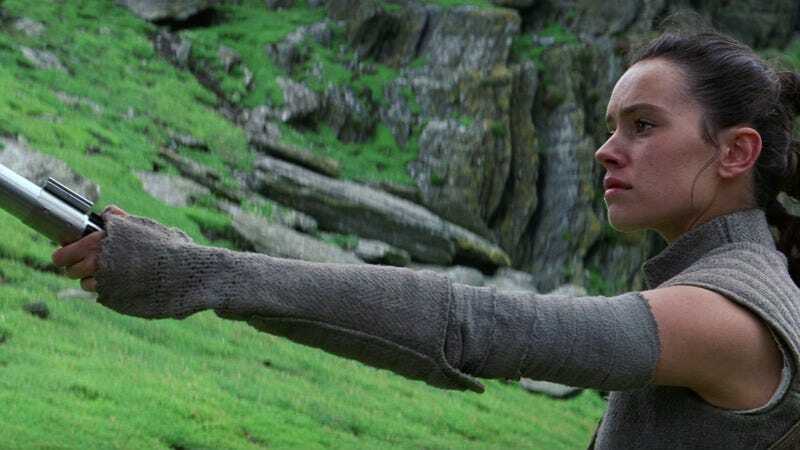 As reported by the Los Angeles Times’ Daniel Miller, Luke’s query to Rey (Daisy Ridley) was one of several snippets of Star Wars Episode VIII—The Last Jedi screened for shareholders today, footage that also included glimpses of Chewbacca, General Leia Organa, Finn, an X-Wing that’s seen better days, and the environmentally diverse landscapes of a galaxy far, far away. The footage was preceded by a prank of sorts, Disney CEO Bob Iger’s version of telling a bunch of investors “I’ll take you to meet Yoda,” then crowding them all into a tiny swamp hut before going “Surpise! I’m Yoda.” This lesson on the value of patience was delivered in the form of an abrupt cut that followed “a few seconds” of Rey returning Anakin Skywalker’s lightsaber to Luke. The fuzzballs in the audience having thoroughly laughed it up, the full clip package followed, followed by a brief tribute to the late Carrie Fisher from Iger. The CEO also referred to the Rian Johnson-directed Last Jedi as “a perfect chapter in the iconic Skywalker family drama,” a statement that’s consistent with the formal announcement of Episode VIII’s title and bilingual speculation that there’s more than one last jedi. Star Was Episode VIII: The Last Jedi opens December 15, 2017. For more details on the film’s contents, we turn to the cast of Murder On The Orient Express.